The meeting will be held at the recently renewed Paleontology Museum of Castilla-La Mancha in Cuenca. The Museum was built in 2015 but was totally refurbished in 2018 with almost 2 million € of public investment. The building has a modern architectural style made by Carlo Asensio, José María de la Puerta and Paloma Campo. The project started in 2000 and ended ten years later. The exposition inside has more than 200 fossil pieces and 20 life size reproductions. The museum hosts the most impressive fossils from two of the most famous fossil lagerstätte of the European Creataceous, Lo Hueco and Las Hoyas. Lo Hueco was discovered in 2017 near Fuentes (Cuenca). This upper cretaceous fossil site has a huge amount of fossil remains, ranging from crocodiles to giant titanosaurs. You can see a lot of pieces from these dinosaurs in the exhibition! Las Hoyas fossil site was found in 1988 near Palancares and Tierra Muerta (Cuenca). 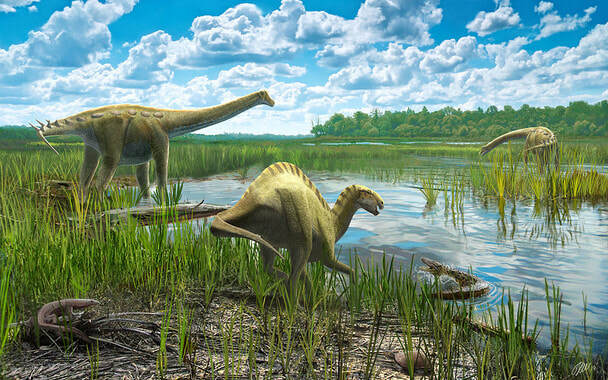 The environment that researchers have inferred from this lower Cretaceous fossil site is similar to modern wetlands. Thousands of fossil remains have been found, which allow scientists to recreate the rich ecosystem that existed here 120 ma. One of the particularities of this fossil site is the exceptional preservation of their remains. There are many fossil remains with soft parts preserved: from plant leaves to feathers. The museum shows the best preserved and amazing pieces of this fossil site, like the famous theropod Concavenator corcovatus or the amazing mammal Spinolestes xenarthrosus.